The Flight 001 Spacepak System optimizes luggage space to allow maximum wardrobe options and eliminate clutter. Each piece is sold separately. Dimensions: 16" x 11.25" x 4.25"
Dimensions: 13" x 9.5" x 3"
Dimensions: 13.75" x 6" x 5.5"
Great place to transport clothing extras in my backpack. Founded in 1998 by frequent fliers John Sencion and Brad John, Flight 001 is here to help you pack well, carry-on, and power up wherever your travels take you. 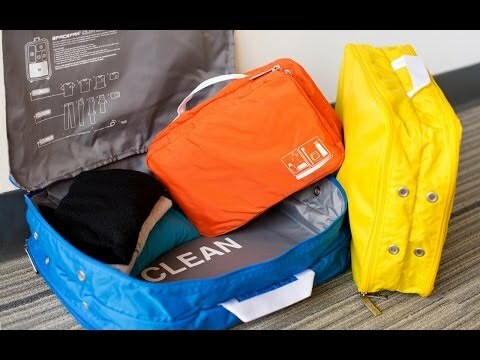 Perfect for the over-packer, Spacepak compression bags release excess air, so you can fit more belongings in less space. Individually labeled for clothes, lingerie, shoes, and toiletries, each Spacepak bag makes it easy to organize your suitcase and find what you want, when you need it. Turn them inside out, and use to separate and store dirty laundry. For overseas travels, it’s simple to stay plugged in and connected with the 4-in-1 power adapter that works in 150 different countries. Whether you’re a jet setter, weekend warrior, or business commuter, you’re sure to want these award-winning products from Flight 001 on board with you.